2013 A Creative Year Ahead! I find my self technically challenged often these days, I also find it exciting! I love my new iPad but am still figuring out how to do things. I always thought I would be a PC gal but I love my iPad. Slips in my purse perfectly too! My blog I have been neglecting, having trouble posting from my iPad so have to work that out especially with March being National Craft Month! Lots of creativity happening, I am part of a new design team, more about that to come! 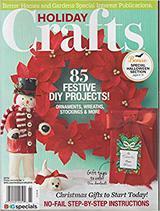 More crafty challenges too! my new place has been taking a lot of my time. Final inspection tomorrow and few other details to put in place and my new venture Quartermain House is ready to open! 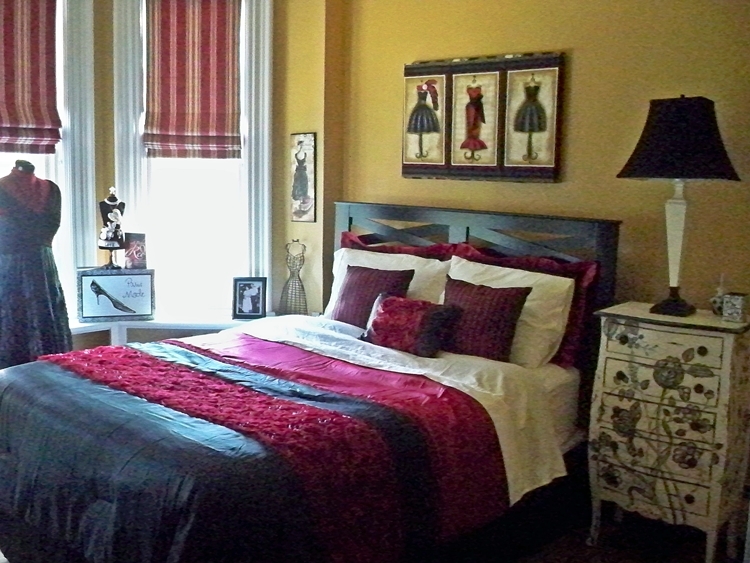 A cozy B&B with three beautiful guest rooms on the river in a heritage home! I love decorating and entertaining, I love my creative work and it all comes together nicely in this new venture. I wanted To travel a little less and do more at home so it is happening, a couple trips a year will be perfect and now I am teaching and exhibiting here more plus the home of my dreams literally. The other wonderful news is I am now engaged to the most darling man who has been a huge help around here. Life is good, very good indeed! Here is to a wonderful year ahead! Happy New Year Everyone! May 2013 be a year filled with joy, meaning, gratitude & dreams come true! 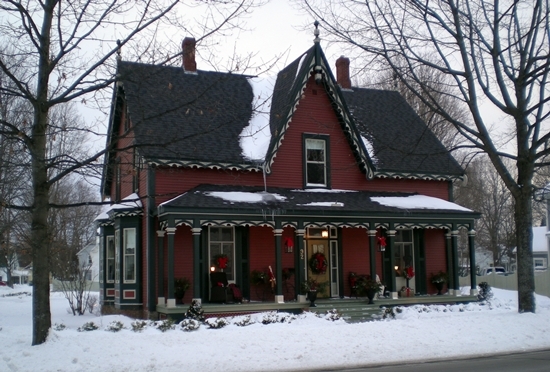 The holidays were wonderful here at Quartermain House, I saw Christmas through the eyes of two exchange students who had their first Canadian Christmas, for one his first Christmas ever, what a treat! Family and friends gathered, six little ones built gingerbread houses. The house was filled with wonder, laughter and love! A snow covered story book setting. I love hydrangea, they have such dainty blooms and last throughout the season with their hues subtly changing. Come fall they dry beautifully to be enjoyed inside. Now living in a older home with six mantles to decorate I wanted to do something different for each one and also something quick and easy. For the formal parlor hydrangea and dried roses were ideal. 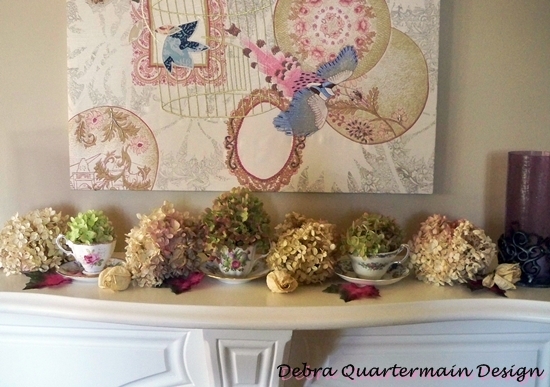 I placed three teacups filled with water and fresh hydrangea filled in with dried blooms and silk leaves. 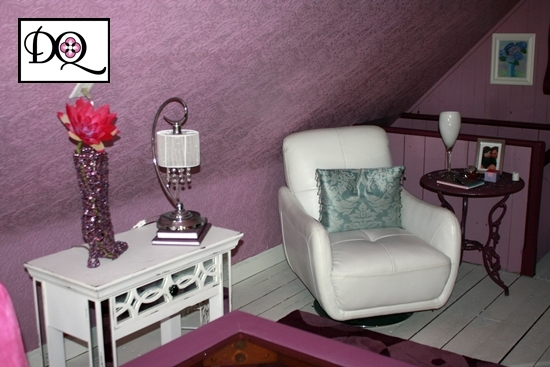 It turned out very pretty and suits the parlor, delicate and feminine. Using items you have on hand like the tea cups and combining natural elements from the garden makes a display or arrangement both easy and meaningful. Being surrounded by beauty feeds the soul and our homes should be a space we love to be in. Love where you live! I love dresses, anyone who knows me usually sees me in a dress. The little black dress was an inspiration for my room. Red is the color so roses are sprinkled across the bed. The dress form wears one of my favorite dresses. The dress form was a special surprise Christmas gift from my youngest daughter Kate, I love it and it is perfect in the bow window! I did not paint the gorgeous dresser but I did redo the lamp and make the wall hanging above the bed. 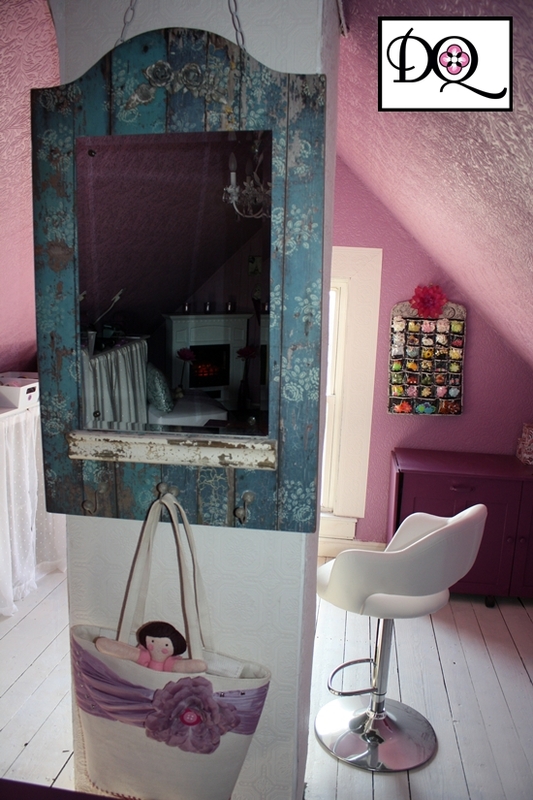 The other three bedrooms are more Victorian in keeping with the 1840's home but I went slightly more modern and decidedly feminine! Once the new ensuite is finished it will be a very romantic retreat! We should love our spaces, our homes to be a reflection of who we are. Everytime I walk into my room it makes me smile! Have a delightful creative day! Today is the first Monday of the month which means the Designer Crafts Connection Blog Hop! Today this talented designer group is featuring crafty designs made with school supplies. I always look forward to participating but having recently moved I am still unpacking my craft supplies and getting organized. I am out of the loop for this round but hop over to Julie McGuffee's blog to get hopping! We always have a great give away too! Speaking of school :) as I smoothly segue here! 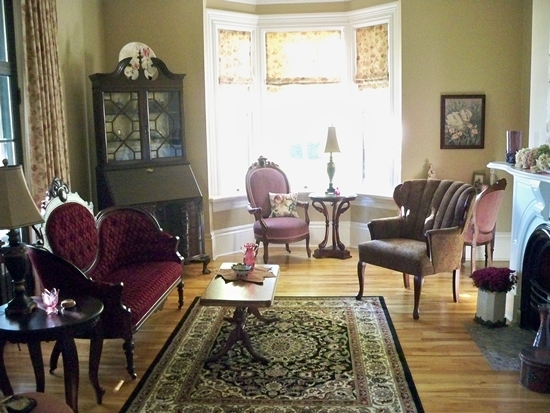 I just moved into the most beautiful house, a heritage landmark overlooking the river in downtown Fredericton. 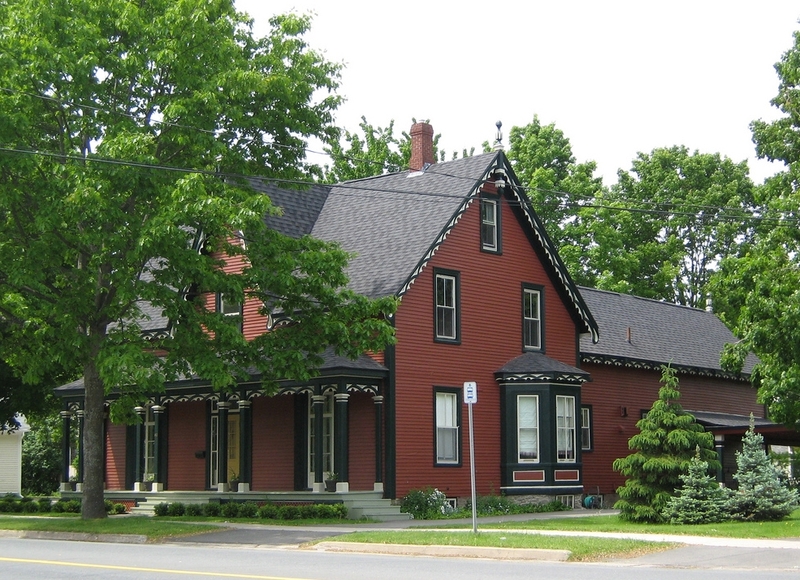 It is a classic Gothic Revival Style built around 1840 and was purchased in 1870 by the first province born University of New Brunswick president Thomas Harrison. Later Premier McNair who held four terms and was appointed Lt. Govenor lived in the home for forty years. 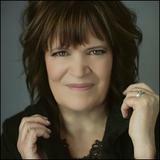 Premier McNair held three degrees from UNB. The home has a rich heritage and is beautiful. I feel like I have lived here forever! I love the Victorian era so I now have an excuse to dress in period outfits! :) More exciting plans are in the works for the place!